Credit: Image by David Gochis, NCAR. BOULDER–The National Center for Atmospheric Research (NCAR) announced today that it has selected its next supercomputer for advancing atmospheric and Earth science, following a competitive open procurement process. The new machine will help scientists lay the groundwork for improved predictions of a range of phenomena, from hour-by-hour risks associated with thunderstorm outbreaks to the timing of the 11-year solar cycle and its potential impacts on GPS and other sensitive technologies. "We're excited to bring more supercomputing power to the scientific community," said Anke Kamrath, director of operations and services at NCAR's Computational and Information Systems Laboratory. "Whether it's the threat of solar storms or a heightened risk in certain severe weather events, this new system will help lead to improved predictions and strengthen society's resilience to potential disasters." "Researchers at the University of Wyoming will make great use of the new system as they continue their work into better understanding such areas as the surface and subsurface flows of water and other liquids, cloud processes, and the design of wind energy plants," said William Gern, vice president of research and economic development at the University of Wyoming. "UW's relationship with NCAR through the NWSC has greatly strengthened our scientific computing and data-centric research. It's helping us introduce the next generation of scientists and engineers to these endeavors." The new data storage system for Cheyenne will be integrated with NCAR's existing GLADE file system. The DDN storage will provide an initial capacity of 20 petabytes, expandable to 40 petabytes with the addition of extra drives. This, combined with the current 16 petabytes of GLADE, will total 36 petabytes of high-speed storage. The new DDN system also will transfer data at the rate of 200 gigabytes per second, which is more than twice as fast as the current file system's rate of 90 gigabytes per second. The system will include powerful Intel Xeon© processors, whose performance will be augmented through optimization work that has been done by NCAR and the University of Colorado Boulder. NCAR and the university performed this work through their participation in the Intel Parallel Computing Centers program. "The new system will have a peak computation rate of over 3 billion calculations per second for every watt of power consumed," said NCAR's Irfan Elahi, project manager of Cheyenne and section manager for high-end supercomputing services. Solar storms. Innovative, three-dimensional models of the Sun will lay the groundwork for predictions of the timing and strength of the Sun's 11-year cycle as well as for days-ahead forecasts of solar disturbances that can generate geomagnetic storms in Earth's upper atmosphere. 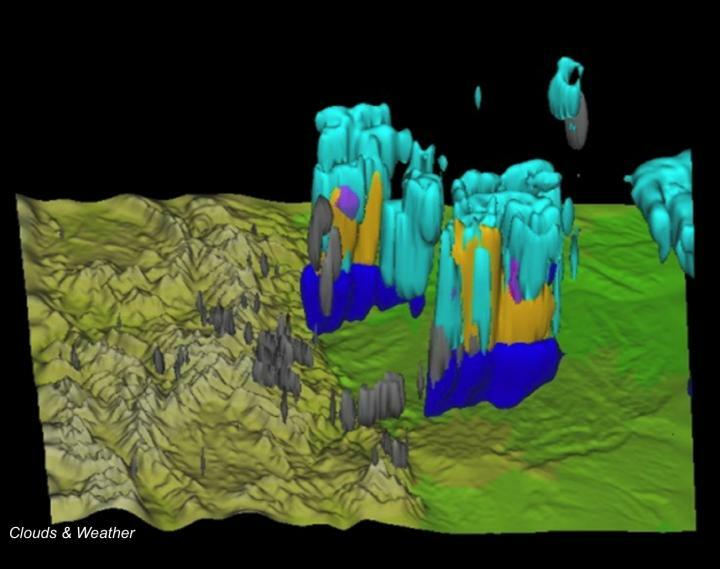 "Supercomputing is vital to NCAR's scientific research and applications, giving us a virtual laboratory in which we run experiments that would otherwise be impractical or impossible to do," said NCAR Director James Hurrell. "Cheyenne will be a key component of the research infrastructure of the United States through its provision of supercomputing specifically tailored for the atmospheric, geospace, and related sciences. The capabilities of this new system will be central to the continued improvement of our ability to understand and predict changes in weather, climate, air quality, and space weather, as well as their impacts on people, ecosystems, and society."